By John Byrnes | April 30, 2013. Dublin finished their last round of league clashes in this year’s Allianz Football League with a late draw against All-Ireland champions Donegal in Ballybofey. Despite dominating for large parts of the game, Donegal were condemned to relegation following a last-minute score from Dublin’s Paul Mannion. Mannion’s point levelled the scores at 0-13 to 1-10 and that outcome, combined with results elsewhere, means Jim McGuinness’ men will be playing in Division Two next season. Donegal had looked the more-determined side in the opening few minutes of the match. Their encouraging start was duly rewarded, with Colm McFadden scoring a well-taken goal in the 10th minute. They then added to their first-half tally with scores from Michael Murphy and Patrick McBrearty. Although trailing Donegal for the whole of the first half, Dublin went in at the break only three points behind their hosts; this was thanks partly to three important points from Dublin’s Paddy Andrews. A great save from Dublin’s captain Stephen Cluxton in the 54th minute kept the away side in the game and they soon began to eat into the Donegal lead. 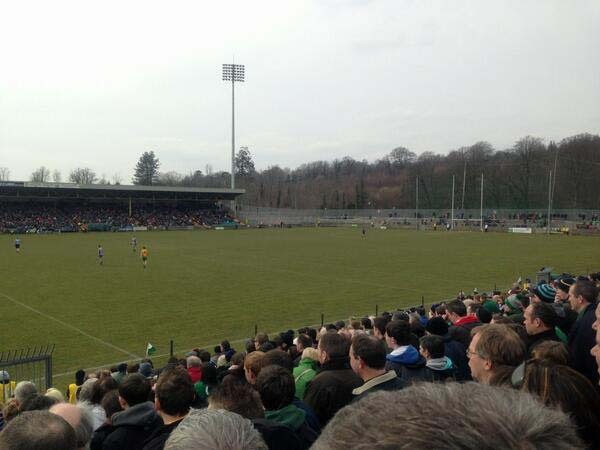 With Kerry overcoming Tyrone 1-16 to 2-12 in Omagh, Donegal needed a win to stay in the top tier. Their hopes of retaining their Division One status were to be dashed however as Mannion’s point ensured the match would finish in a disappointing tie for the reigning All-Ireland holders. Dublin can emerge from this stage of the competition with a lot of confidence and can now look ahead to their semi-final fixture against Mayo in Croke Park on 14 April. The Dubs have already overthrown Mayo in this year’s league campaign and will look to repeat the feat in what promises to be an exciting fixture. Tyrone and Kildare will contest the other semi-final on the day. They both qualified for the last four despite losing their final league matches. Donegal and Down have both been relegated and will play Division Two football next year. The two vacant spaces in Division One will be filled by Derry and Westmeath.